Around the end of school last year, we went to a local restaurant that happens to be our favorite, or at least our favorite place outside the city. I (Celine) ordered a pizza topped with spicy tomato sauce, clams, bacon, caramelized onions, crispy fingerling potatoes, Parmesan cheese, and sharp provolone. It was amazing! Clams on pizza sounds really weird, but I was pleasantly surprised by how not-weird it was! 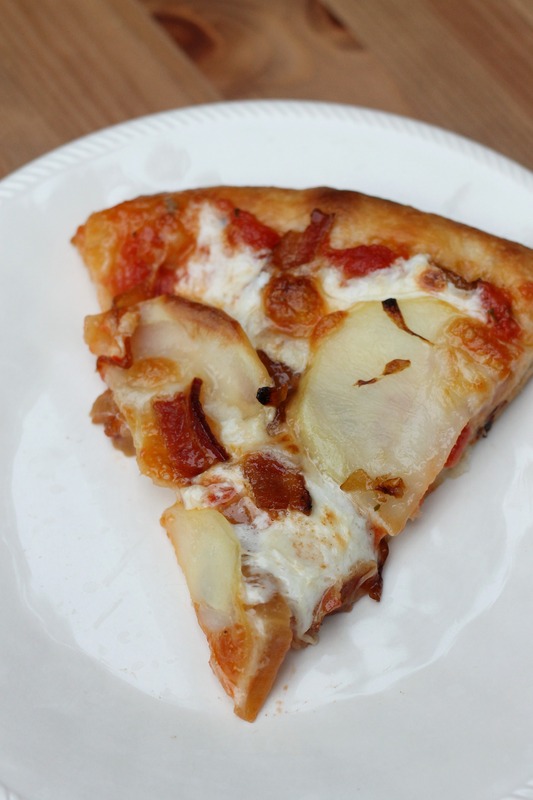 Potatoes are also a not a typical pizza topping, although a little more mainstream than clams. Anyway, I have been planning on recreating this pizza for ages and finally got around to it recently. We decided that we could not put clams on our pizza, because 1) we have no experience cooking with or purchasing clams, and we didn’t want to risk spending a lot of money for them to be on a pizza (and potentially ruin them in the process) and 2) while our brothers, or the oldest two, are adventurous eaters, clams on pizza is a different genre of pizza topping than what they are used to! We started with our favorite pizza crust (recipe coming hopefully soon! ), and made a spicy tomato sauce. For the potato component, we thinly sliced russet potatoes with a mandoline, drained them, and baked them for about 15 minutes to soften them a bit (although depending on how thin your slices are, you could probably get away with not cooking them at all). We caramelized some onions, cooked up some bacon and put it on a pizza with provolone and a bit of mozzarella for creaminess. This pizza was just as good as the one from the local restaurant, and it didn’t cost $15 for a single serving! Honestly, though, this is probably one of the best pizzas that we’ve made. It’s smoky, salty, cheesy, spicy, and slightly sweet from the caramelized onions. We can’t wait to make it again! By the way, we are planning on (in the next few weeks/months) making and posting more of our own recipes, rather than sharing slight adaptations of other recipes found online or in cookbooks. Even though there are a lot of great recipes out there, we hope to improve our blog and challenge ourselves by making our own recipes (either fully conjured up by us or inspired by something we tried in a restaurant, as is the case here). 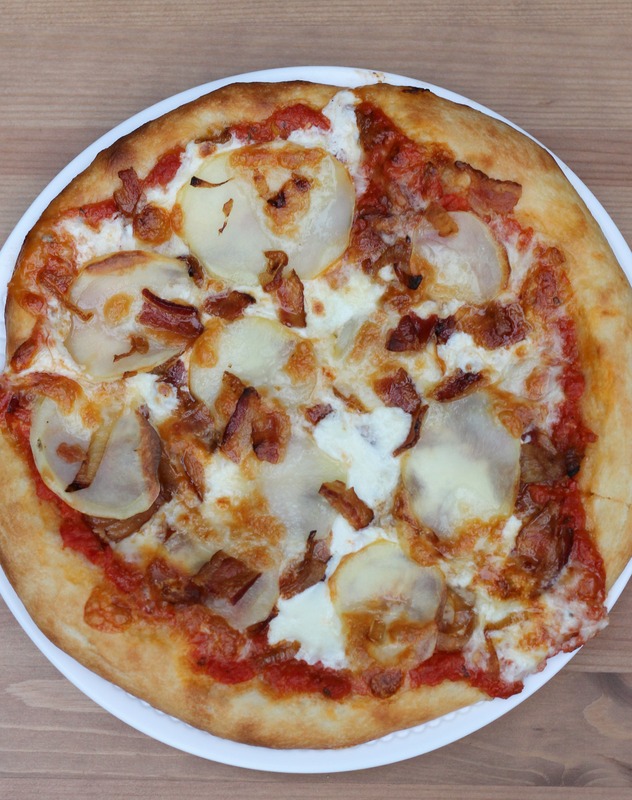 We were happy how this pizza turned out, and we hope to have such successes in the future! Easier said than done, right? But we are up to the challenge! This might mean a few less posts per month, but hopefully they will be more original to us and therefore more meaningful. P.S. Sorry for the pictures in today’s post- the lighting is a little rough. We were racing the light to photograph it because we knew there was no way it would last till the next day! Trust us, this pizza looks (and tastes) amazing. Preheat the oven to 500 degrees F with the pizza stone on the middle rack. Combine the olive oil, garlic, and red pepper flakes in a medium saucepan. Heat until the garlic is sizzling. Pour in the diced tomatoes and cook, stirring occasionally, until slightly thickened. Add salt and pepper to taste. Using a blender or immersion blender, puree the sauce until a few chunks remain. Taste the sauce and add more red pepper if necessary. Set aside. Heat the oil in a medium saucepan. Add the onions, sugar, salt, and pepper. Cook over medium-low, stirring every couple of minutes. Cook until golden brown, about 20-25 minutes. Towards the end, de-glaze the pan with the wine and scrape up brown bits. Remove from heat and set aside. Using a mandoline or a very sharp knife, slice the potatoes very thinly. Soak in a bowl of warm water for 10 minutes, then drain and pat dry. Line a medium pan with foil and coat with nonstick spray. Arrange the potato slices in a single layer and sprinkle with a small amount of salt and pepper. Bake for about 15 minutes or until the potatoes begin to soften and the edges brown lightly. Place a square piece of parchment paper on a cutting board. Grease your hands with olive oil. Divide the dough by three and stretch out/press one of the pieces into a 12-inch round on the paper. Spread with some of the sauce and top with about 4-6 provolone quarters. Sprinkle with onions, bacon, and pieces of mozzarella. Add half of the potato slices. Top with more provolone. Brush the crust with olive oil. Transfer to the pizza stone and bake until golden brown and bubbly, about 10-15 minutes. Carefully remove. Repeat with the second pizza, slice, and enjoy!